2 Cor 7:1: Since we have these promises, dear friends, let us purify ourselves from everything that contaminates body and spirit, perfecting holiness out of reverence for God. 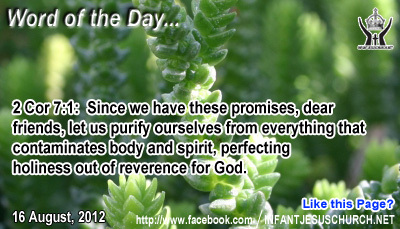 Heavenly Father, Purify our heart, our life, our body, our power. May our words and our thoughts be blameless in your sight. We want to be holy as you are holy and honor you as only you are worthy of honor. You alone are God! Through Infant Jesus we ask it. Amen. Today’s Gospel Jesus teaches that one must forgive in order to be forgiven. If we do not forgive our fellow human beings, we cannot anticipate God to forgive us in turn. The Apostle James says that "judgment is with no merccy to one who has exposed no mercy". Mercyy is truly a gift and it is obtainable in such a way that justice is not negated. Mercy seasons justice as salt season’s meat and gives it taste. Mercy follows justice and perffects it. To pardon the unapologetic is not mercy but license. CS. Lewis, a 20th century Christian writer wrote: "Mercy will flower only when it produces in the crannies of the rock of Justice: relocated to the marshlands of mere Humanitarianism, it becomes a man-eating weed, all the more unsafe because it is still called by the same name as the mountain diversity." If we want mercy shown to us we must be ready to forgive others as God has pardon us. Do we hold any grudge or bitterness towards anyone?